Guidelines for Intra-Muscular Injection of Hydrocortisone (Solu-Cortef) - Important information. This could save your life! Source: New Zealand Addison's Network (NZAN) - Thanks to Jeanette Crossley! 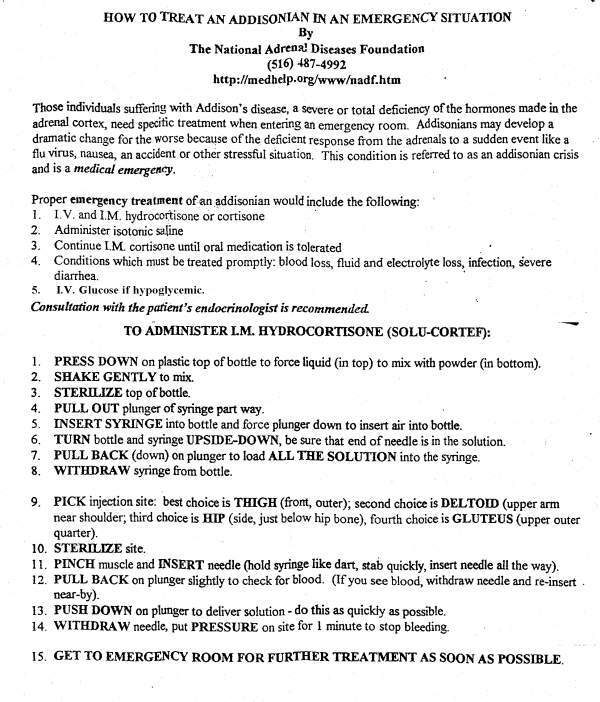 Instructions on how to treat an Addison's crisis. 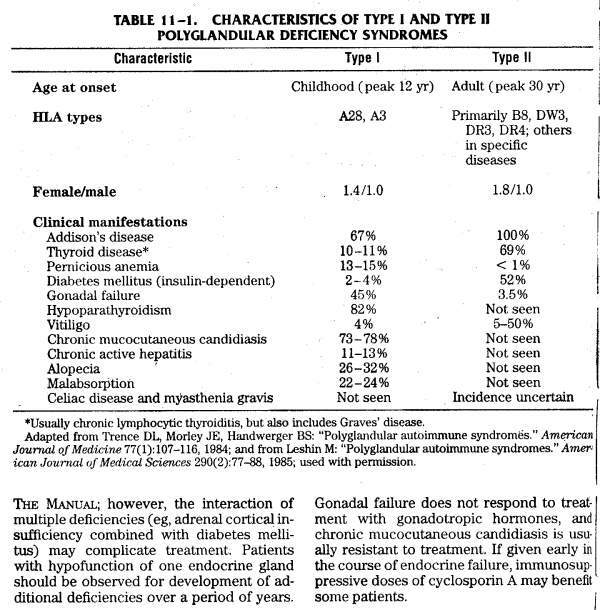 Characteristics of polyglandular deficiency syndromes. Signs and symptoms of Addison's Disease. Here's a section of an article that goes over the dosage of hydrocortisone and fludrocortisone for Addison's patients. It states that the goal is to use the smallest dose of hydrocortisone that maintains the patients well-being and physical strength (relieves Addison's symptoms). This will minimize the risk of osteoporosis and for diabetics, help reduce instability in their blood sugar. Article Source: Wolfgang Oelkers, M.D. 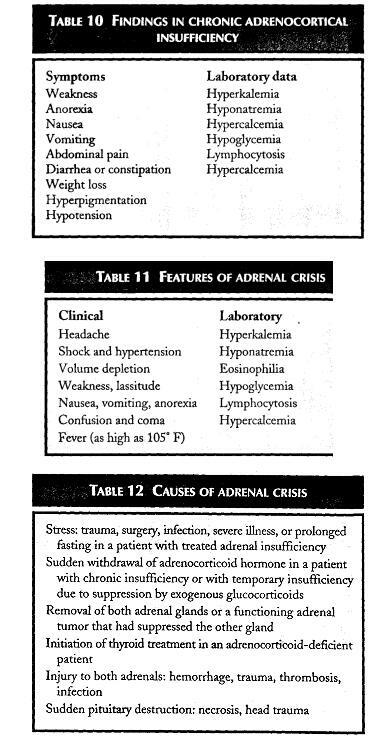 : Adrenal Insufficiency. This is actually a link to some excellent articles at UpToDate.com covering adrenal insufficiency. 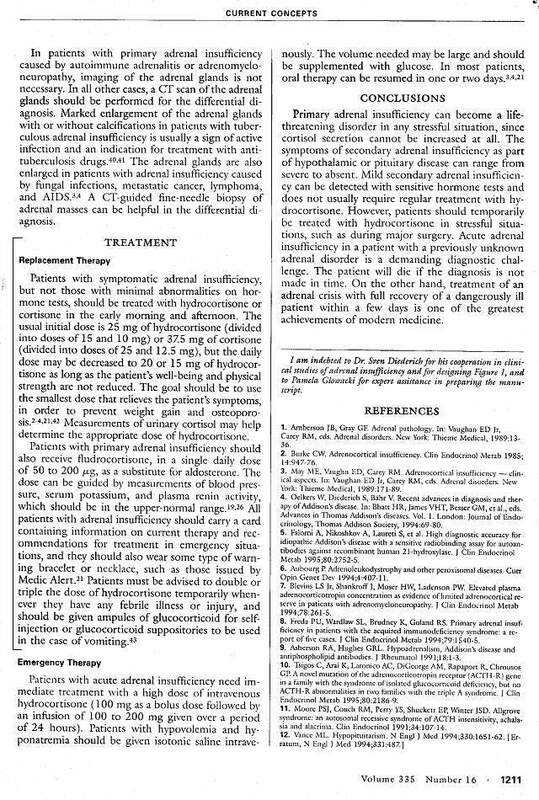 Treatment of Adrenal Insufficiency - This article goes over the shortcomings of the traditional treatment of Addisons with hydrocortisone as it doesn't mimic the normal/natural production cycle of cortisol it's attempting to replace. Prednisone or dexamethasone taken at bedtime is the recommended treatment. These longer lasting glucocorticoids provide a smoother physiological effect and also glucocorticoid activity in the morning when the patient awakens. The last three links can be accessed free for a limited time. 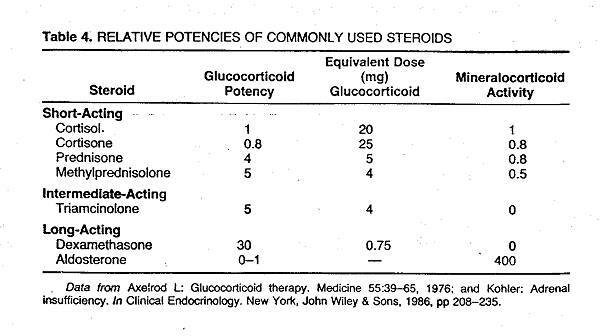 Table with relative potencies of steroids. 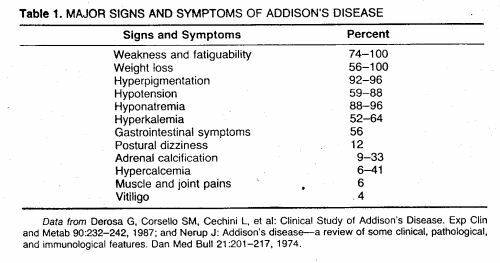 Tables that show symptoms and lab indications of Addison's disease, features of an Addison's crisis, and causes of an Addison's crisis. 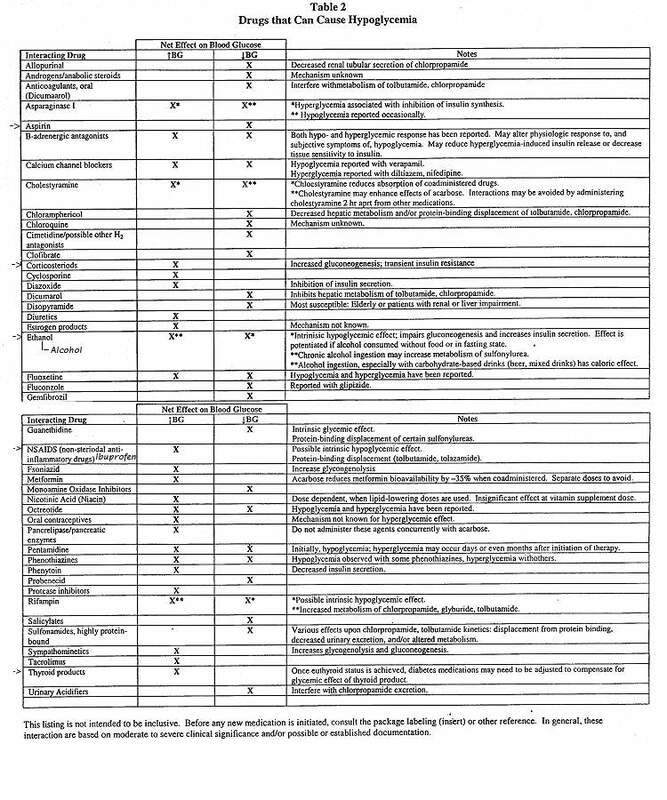 Here's a table that lists drugs that influence blood sugar levels. Be aware that aspirin lowers blood glucose. Thyroid hormones, ibuprofen, and important for Addisonians, corticosteroids such as prednisone and cortisol raise blood sugar. Then there's alcohol, which can lower or raise blood sugar depending on the type of alcohol you drink and how much food is in the stomach. Complete guide for achieving excellent control on an insulin pump. Covers techniques to set and test basal rates, boluses, high sugar correction boluses. The ADA Complete Guide to Carb Counting is an A-Z guide to carbohydrate counting for people with diabetes. It addresses basic concepts as well as more advanced issues related to tight blood glucose control. Topics include portion control, food variation, the importance of protein in carbohydrate counting, the impact of fat on blood glucose, size and frequency of snacks, and exercise. Java Applet that will interpret hemoglobin A1c values. access to the publications referenced here. practices outlined in this site.